The latest internet phenomenon of social buying, popularly termed "groupon" (group+coupon) after the leading website of the same name, has finally caught on in Thailand. These "deal-of-the-day" websites specialize in marketing irresistable deals of discount vouchers offered by participating retailers and businesses, limited by time, numbers and conditions. 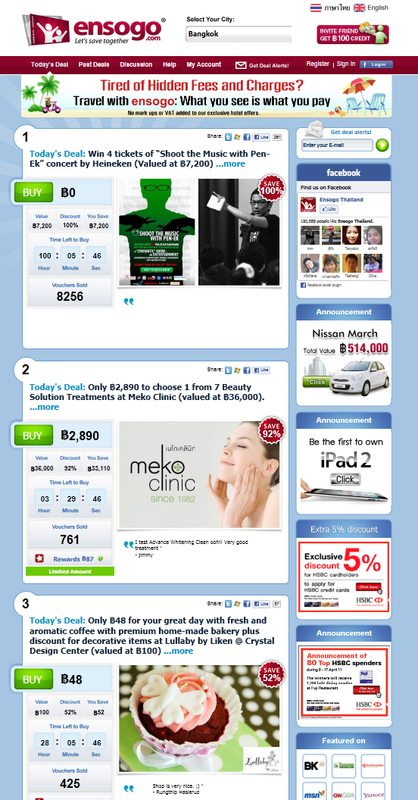 Ensogo (www.ensogo.com) leads the pack of these emerging portals in the Thai market, with many other "interpreneurs" swiftly joining the fray with their copycat versions of Groupon. An interesting feature is that all these websites look and feel annoyingly similar, courtesy of the Web 2.0 trend. The upside is that they're very user-friendly and intuitive to browse. Ensogo [Entertain, Social, Go] guarantees the best deals and even claims to offer refund if you can find a better deal from the same merchant within a month. Deals on their website cater to popular demand and include restaurants, bakeries, spas, beauty treatments, hotels, healthcare, concert tickets, furniture, courses/classes and more. Some interesting and worthy deals in the past have included 50-90% discount coupons from Sizzler, Secret Recipe, Subway, Kipling, Haagen Dazs, A&W, SF Cinema, and Narai Pizzeria. Many new startups use the platform to promote their businesses and services. Since these deals are limited in numbers and by time, it is best to be updated of their latest offerings by subscribing to their alerts. It is also prudent to watch out for any attached conditions, for instance, some restaurants may accept the vouchers only for lunch. 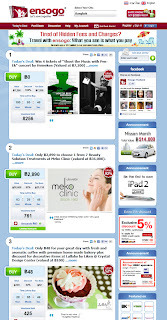 Other fledgeling and upcoming sites worth a checkout are: dealdidi.com, thaicitydeals.com, dealicious.co, dealthailand.com. The Net has finally come through for us bargain hunters!